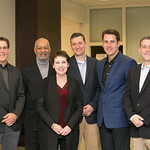 From left to right: Jayson Stark (formerly of ESPN), Charles Grantham (Stillman School of Business), Dean Deirdre Yates (College of Communication and the Arts), B.J. 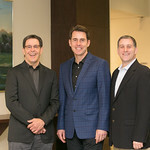 Schecter (Professional-in-Residence), Tom Verducci (Sports Illustrated), and Marc Weiner (MLB and NHL Network). 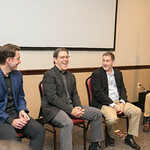 The College of Communication and the Arts recently hosted a lively interactive discussion with three leading sports media professionals about strategies on how to cover and report on America's game during "Baseball and Spring Training: Covering America's Game Today," a sports panel discussion held on February 7, 2018. 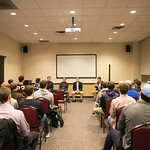 The event was the first of three in the College's exclusive roundtable series on the leading topics in sports today. Tom Verducci talks with students after the event. "We're at an interesting point in the life of baseball," said Stark. "Everyone is reading and hearing about the pace of the game. We're seeing, in real-time, two converging forces between the way the sport is being played and the way we're covering the game." 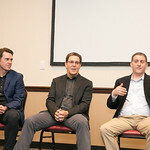 Opening the discussion, the panelists began by emphasizing the dynamic evolution of baseball. It's no longer a sport tied down by tradition; instead, baseball has become a conversation on both sides of the microphone. With an array of statistical information at a reporter's disposal, it is important for sports reporters to understand the language of the game, in the moment and beyond the field. "Statistics have become more readily available, but here's the challenge: it's easy to get overwhelmed by the math," shared Verducci. "My rule of thumb is when you watch baseball, don't take notes. You have to tell the player's story, beyond the numbers, in a way that's digestible for the average fan. Numbers aren't the story; they just illuminate it." 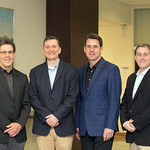 SHU Head Baseball Coach Robert Sheppard and Tom Verducci with students following the panel. Throughout the discussion storytelling wasn't the only best practice in the industry: developing and maintaining trusting relationships is also key. 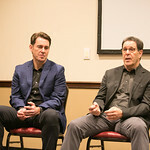 The world of sports media focuses on sharing the players' lives and stories and being able to authentically connect with people "when the notebook is closed and the microphone is off" is critical in the media landscape. For example, when a championship game concludes, there's often chaos mixed in with excitement and disbelief. Navigating that atmosphere is both challenging and daunting, but relationships can make the difference between getting a good and great quote. Weiner shared specific insight from the TV production angle: "Sometimes, you only have two minutes on the field with a player," he said. "If you have a relationship with them and they trust you, they'll most likely choose you." "Read. Read everything you can. 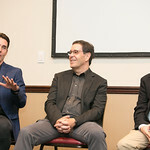 You learn the rhythm of writing and that's the best way to become a better sports reporter," shared Verducci. "Find people you emulate and study them. You can learn so much from watching, listening to or reading the people you admire the most," shared Stark. "Very simply, find your passion and really try to master that. Recognize that a lot of people aren't you, but you have a special mindset and skillset that no one else does," shared Weiner. 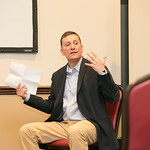 Following the formal panel, Schecter moderated a lively interactive Q&A style discussion with the audience. 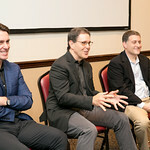 Baseball and Spring Training was the kickoff event of a three-part roundtable discussion series focused on exploring trending topics in the sports industry. 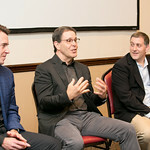 The next roundtable, The Athletic and the Future of Media: The New Model for Sports Coverage, will take place on April 12, 2018 at 7 p.m. in the Faculty Lounge of the University Center on campus. 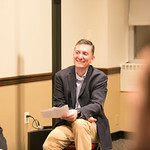 For more about Sports Media in the College of Communication and the Arts, contact Associate Dean Thomas Rondinella.